So from the title you can pretty much guess that I will be discussing Swiss Meringue Buttercream! Ohh my goodness I am absolutely in love with SMB (Swiss Meringue Buttercream). It is so silky and taste heavenly..it is a little cloud on a spoon..yes its just that good. Trust me when I say once you try it you will not want anything less!!! 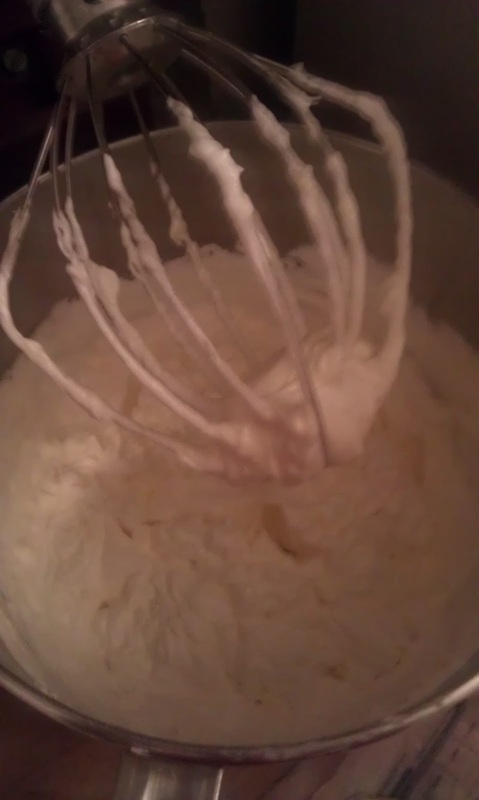 You will find many different recipes of SMB online but the base of the recipe is always the same...you heat egg whites and sugar to create a syrup and then you whip that into a meringue state. You then add in butter to make a light, fluffy buttercream that most cake decorators will tell you is hands down better than American Buttercream (the extra sugary stuff). There two other types of meringue buttercream (Italian and French) but I prefer SMB for the ease of it. It holds flavor wonderfully so you add simple flavors like vanilla extract or more complex flavors like fruit puree. It's simple enough in its concept that even a basic cake decorator can learn to make it by following the steps laid out. If you would like more information about buttercream you can check out Sweetapolita's Blog for her post entitled Swiss Meringue Buttercream Demystified or Baker Royale's post on SMB under her baking basics posts: How to Make Swiss Meringue Buttercream Frosting. With that out of the way...on to the buttercream!! 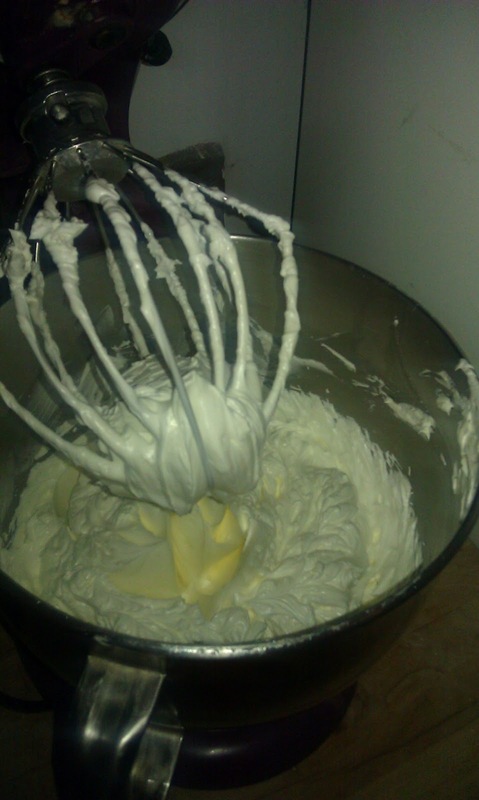 The first thing you want to do when making SMB is make sure all of buttercream making supplies are grease-free. 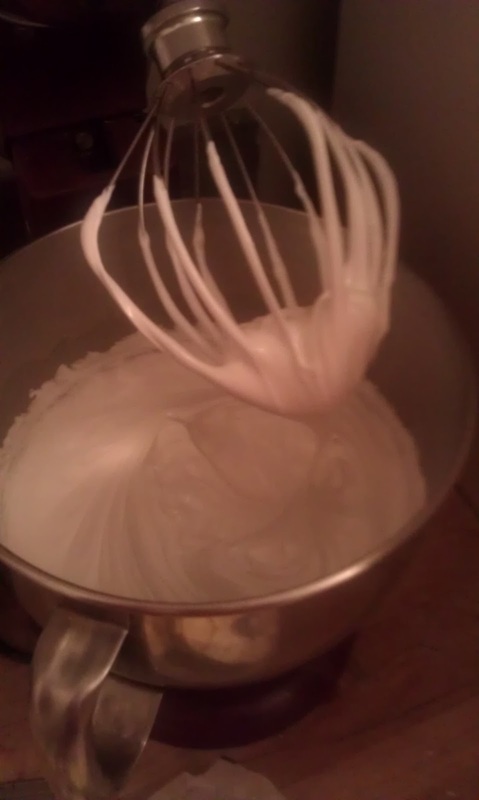 You have grease in your bowl or your whisk when you go to make your meringue it will look kind of "soupy" and not very meringue. You also want to make sure that your butter (real butter people please) is room temperature to make the mixing easier. 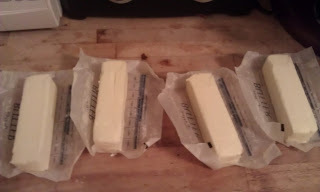 I open up each stick of butter and let it sit out for a couple hours to come to room temp. Next you want to measure you sugar and egg whites. I don't have a picture of this step because its pretty easy. Follow the recipe I provided below with the measuring of the sugar. For the egg whites...I recommend fresh ones. You will come across some decorators who have had success with egg whites in a carton, but I have had NO success using them..so fresh is best. If there a decorator out there who has had success with carton egg whites please let me know the brand and I will give it a try because I hate wasting the egg yolks. Once your sugar/egg white syrup has reached at heating point of 160 degrees (to make sure you fully pasteurize the eggs, some decorators say 140 degrees but I stick with 160 degrees to be on the safe side). Remove the mixing bowl from the pot and put it on your mixer and run the mixer on medium (7 if you have a KithenAid). 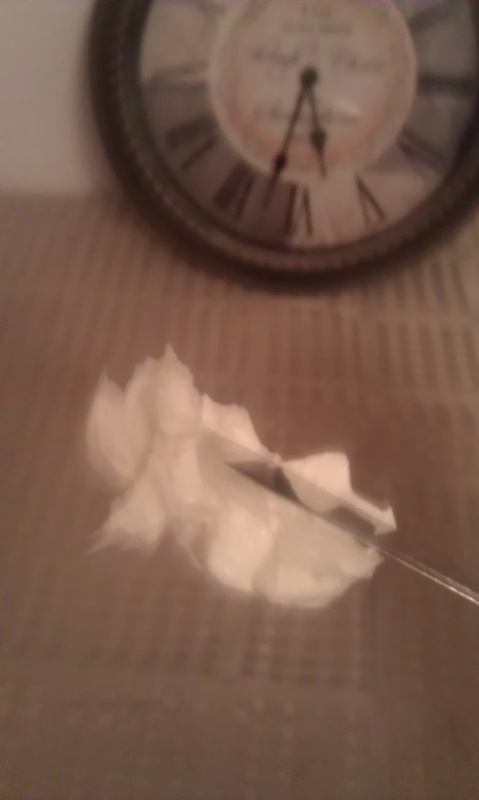 The next photo shows the meringue after a few minutes of mixing. As you can see its shiny and starting to peak. That's good. You want to mix your meringue for about 10 minutes or so until you reach stiff peaks and the bowl is cool to the touch. You will know you hit stiff peaks if when you stop the mixer, remove the bowl and the meringue on the whisk stays there. The meringue will also have fluffed up and thick. I don't have a picture of the thick peak stage but you get the picture from the one up top and my description. At this point you want to add in the butter a pat at a time making sure each pat of butter is fully incorporated before add in the next one (no lumps). As you add in the butter, you will notice that the SMB will start to take on a curdled look to it..NO WORRIES..keep adding butter and mixing. As this picture shows..my SMB is slightly pass the curdled stage.. its still looks slightly curdled but its starting to look like buttercream. Just keep adding your butter in a pat at a time until your butter is all gone. By the time you get to the last pieces of butter you will see a beautiful SMB come together. The picture below shows my SMB on the whisk. See how fluffy it looks but is sticking solidly to the whisk. That is what you want. This is SMB once you have whipped all the butter together. It has a slightly yellow color to it (that is all the butter). It's light but holds its shape. You SMB is now done! At this one I would fill and crumb coat my cake if they are cooled at this point. SMB needs to be refrigerated if you aren't going to use it right away. You must note: when you bring SMB out of the fridge you have to let it come up to room temperature and run it through your mixer for a little bit. You see how it sticks to the knife..that is what you want. It is one of the best tasting buttercreams EVER!!! Don't believe me...ask a cake decorator who has made it before..they will tell you they love the stuff. Don't be afraid..dive in and try it. Once you go SMB you won't go back:) If you still have some questions about it or any stage I discussed above...please see one of the posts I linked to earlier. They explain every aspect about SMB. 1. Wipe the bowl of electric mixer with paper towel with lemon juice to remove any grease. Add egg whites and sugar. Simmer over a put of water, whisking constantly until temperature reaches 160F degrees. If you don't own a candy thermometer, then continue whisking until the sugar has been completely dissolved and the egg whites are hot. 2. With your whisk attachment on your mixer, begin to whip until meringue is thick, glossy and the bowl is cool to the touch. Don't add the butter until the bowl is cool. 3. 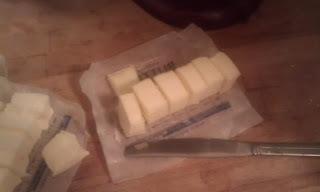 Start adding butter cubes, one at a time, until incorporated and mix until the SMB is silk smooth in texture. If your SMB is runny then put in the fridge for 15 to 20 minutes to cool down and re-attach until it comes together (meringue wasn't cool). Add your vanilla and salt until well incorporated. -Keep in airtight container in the fridge for up to one week, leaving out at room temperature when needed. Re-whipping when need for 5 minutes. -SMB can be frozen for 6-8 weeks. 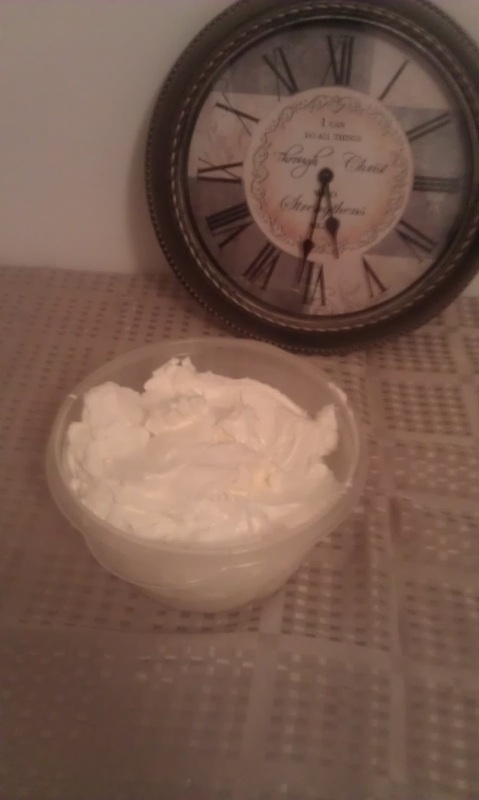 Thaw on the counter overnight and then rewhip for 5 minutes.